Who hasn’t wanted a behind-the-scenes looking into the private garden of a public gardener? Bringing your work home with you can actually be a very good thing… when both your vocation and your avocation relates to gardening. Such is the case for Dan Benarcik and his wife Peggy Anne Montgomery. Both work in professional horticulture: Dan, at Chanticleer — one of the country’s most admired public gardens, while Peggy is a champion of native plants and the important role they play in the landscape. Dan Benarcik and Peggy Anne Montgomery getting ready to share some of their wonderful story on camera. But it’s at home where the real magic happens. Thanks to their keen eyes for design and a strong shared knowledge of plants, there’s always something interesting to see throughout many outdoor rooms. Their beautiful garden is a laboratory of sorts where the couple is always experimenting with different plants yet with an abundance of native selections to provide wildlife habitats. 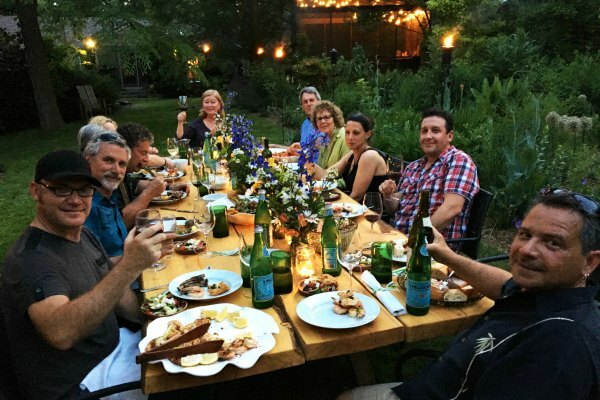 Perhaps one of the most spectacular garden-side dinners we ever attended with great food, and wonderful friends. It’s a common occurrence in Dan and Peggy Anne’s garden. When not enjoying a peaceful morning or evening with just each other, Dan and Peggy’s greatest joy is sharing their garden with friends and family. Yet they never miss an opportunity to close out each day with one last stroll together in the garden, hand-in-hand of course. This Wave Hill chair is one of many in Dan and Peggy Anne’s garden. Another love of Dan’s is woodworking. The table above was milled from a fallen tree from his property. He’s amassed quite a collection of wood from his garden that is just waiting for the next project. One project that Dan enjoys as a small side venture is selling Wave Hill chair kits. The same chairs seen in this episode that you can make entirely from scratch as we demonstrated. But if you’d prefer to buy the pieces already cut and ready to assemble, you have that option as well, thanks to Dan. He’ll ship you a ready-to-assemble kit, complete with the hardware, at a price that makes the convenience all worth while. Rob Cardillo website – The photographer who provided the stunning images featured at the beginning of this episode and for The Art of Gardening, Chanticleer’s beautiful book with breathtaking photos by Rob over all four seasons. Treat yourself to a few minutes on Rob’s website for the most incredible photo’s of garden-related imagery. I have really enjoyed all of your shows. I saw the bicycle compose edition. I was really impressed the young men who started it. I have started growing native plants and not using in chemicals in my yard and small garden. You are doing a wonderful thing with producing such a rich, valuable show. It must be in our nature, especially in these days we are living, to decipher what must be the most grounding and fundamental necessity of our lives today; organic cultivation. We recently purchased 143 acres in Mo. and believe me it is rough, but it has more going for it than against it. As a landscaper and lover of nature, I hope we can transform it into an oasis of gardens, native, drought tolerant species and incorporate patches of cedars, woodlands, hills and depressions within the property. Again, my wife and I have a lot of work, little funds left, (after buying the property) but it is our dream to make it happen. We will keep you informed every step. I will definitely link you in my website. Thanks, Chris and Jessica. I loved this episode! BTW, honestly, one of the first things I thought was how wonderful the music was. It drew me into their garden even more, into their experience. The garden, Dan and Peggy’s connection to each other and to nature, her emotion when speaking of what it really meant when Dan opened his garden up to her – this was a very powerful video. Thank you for your positive feedback. So glad you like the music! Dan and Peggy are an inspiring couple and the bond they share with each other and their garden is special. Happy Holidays! Outstanding episode – best one yet! 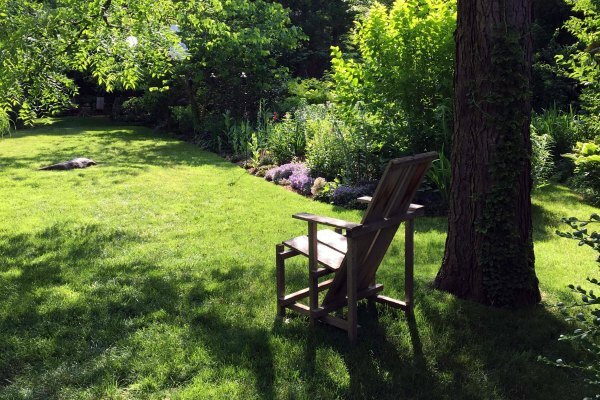 Am enjoying the increased scope of your coverage in other gardens – the chair segment was perfect too! Thank you Brian for your feedback. We are currently filming new episodes for season 9 which will air in 2018. Look for interesting stories in gardens of all types from across the US. Happy Holidays! Great episode! But may I make a request for less background music while people are talking? The spa music is extremely distracting! I record this show for watching after a long day working, it is informative and relaxing. The cooking section of the show is not one of my favorite segments. It is all about plant care that keeps me interested. We are currently busy filming new episodes for season nine which will air in 2018. I loved this show showing a public garden expert in his own garden. I wanted to watch this show again and wanted to show this to my friends but video runs only for the first five or so minutes and gets stuck. Is there a way to see this particular show. Thank you for your great TV program that teaches and inspires home gardners. Dan is an inspiring gardener and person. Thanks for your feedback. Could you provide me information on pruning red rasberries the kind that don’t have thorns? Thanks I saw your show last night 8/16/17 on channel 9 and really enjoyed it! Best show on the air with great recipes. Look forward to seeing it today and I recommended it yesterday and the day before that and again to someone else. I see it as, view, listen, learn and plant. A question comes to mind? The recipe, Red beans and rice with fresh Cilantro. I don’t have fresh thyme, what would the ratio be from fresh to dried? Hope you don’t mind me asking a question. By the way, my neighbor got some Cherokee purple tomatoes! You started something good with that programming. Next spring I and others will be growing them. Thank you to all of you for what you do! Thanks Bernie! On the thyme, I’d go a little heavier on the dried since it lacks the fresh oils to give it the wonderful punch of using fresh. Alternatively, you could buy fresh thyme stems in the produce department of your local supermarket. They’re usually hanging up in clamshell cases near the bagged salads. Hope that helps. Absolutely magical. So glad I stumbled across these productions! This is my favorite episode so far. It reminds me to spend more time enjoying the garden, not just working in the garden. Thank You!